As I mentioned in my What a Year post, we moved into a new house last summer –July 2013 to be exact. Now that we’ve been in the house for one year, things are starting to settle down. I unpacked the last boxes in May 2014. The dust has finally settled and I’m ready to discuss this huge project. In this post I’m going to outline how to survive building a new house, or, how I enjoyed the renovation of this historic Edwardian gem. It’s summer now, and we are enjoying the fruits of our labor (that’s our dining room above, we use it unless we’re eating at the kitchen counter depicted below). We broke ground on the project in March 2012 and for the next 17 months construction went at breakneck speed –I kid you not, our contractor worked quickly and we only had a few delays, which was superb for a construction project of this size and scale. In the future I will discuss the construction and decorating processes in more detail, for now I’m going to chat about how a couple can build or renovate a house successfully, i.e., without getting a divorce. Thankfully, my husband and I realized that since we are both alphas, it might not be best to work together closely on the gut renovation of a 100 year old house. 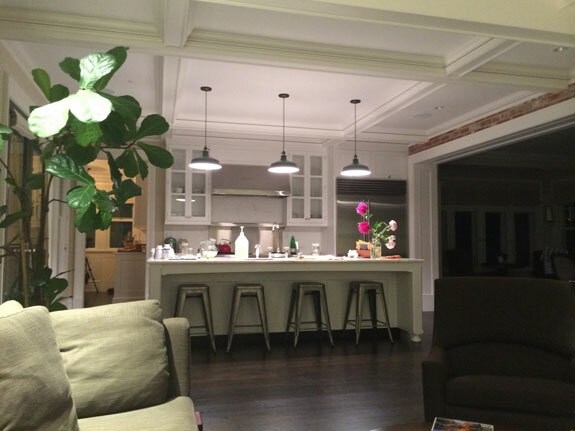 We knew from several remodeling and decorating projects that we had done over the years that this type of process could engender stress, frustration, and disagreement. The biggest question in this type of project is how does one person manage a rebuild so that both people are comfortable and satisfied? My husband and I worked out a system which was smooth and harmonious. I made all day-to-day decisions. I selected materials, winnowing down numerous choices until there were only two or three, then he made the final decisions. 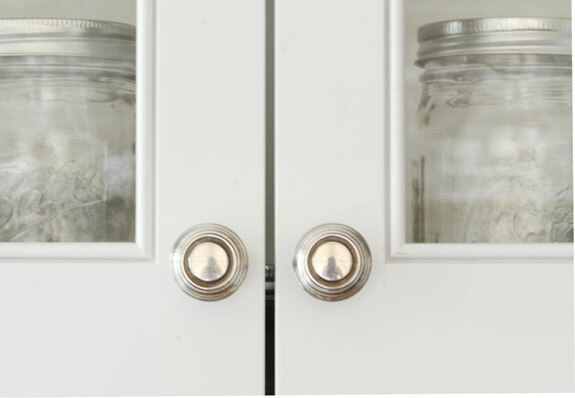 I am a perfectionist when it comes to details and visuals and can often get caught up in indecision (I spent far too long choosing the kitchen pulls in the photo below), and my husband has unbelievable taste and is very decisive, so this was a great system that really fit our needs as a couple. I think it also helps that we are in our late 40’s and have been together for more than two decades. I couldn’t and wouldn’t have done a project of this scale 10 years ago. I did not have the life experience or self-knowledge that I needed when I was 30-something to pull this project off. The house, built in 1904, had undergone several renovations during the last 100 plus years. We decided to remove all of the choppy additions and took it down to the studs. There were no walls or floors when we were done gutting it. We used ladders to get from floor to floor and carefully walked on beams at times to get around. I decided our project would be a green renovation, which was important to me on a both a political and personal level. After graduation from college I worked at the Environmental Defense Fund, and at age 26 founded an environmental consulting company called ecosav, so building a green house was a dream of mine for not years, but decades. It was also a medical necessity for me given that I have multiple chemical sensitivities. Towards the end of the project when all of the finishes were being installed, I didn’t need to wear a gas mask to enter the construction site. Hallelujah. Even better, my family would not be exposed to toxic paints, sealers, and finishes that typically off-gas after a move-in for years to come. I installed a point of entry water filtration system so that not only drinking water would be clean and free of toxins such as chlorine, but our water for bathing would be as well. I also had an infra-red sauna built into our attic (I’ll share more details on this, as well as the health benefits of infra-red light at a later date). In addition to No-VOC finishes, we undertook the massive digging of a geothermal well (our property is one-third of an acre) in order to create an ecologically friendly system for heating and cooling; and we put radiant heat in the gorgeous recycled hardwood floors. 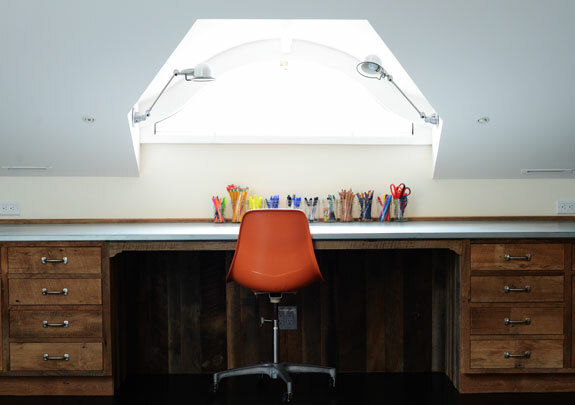 I also used recycled barn wood to build out a craft room in our attic (see photo below). Throughout the house I used upcycled pieces (such as the orange chair in the photo above), many of which I found in my hunts at thrift stores and flea markets. 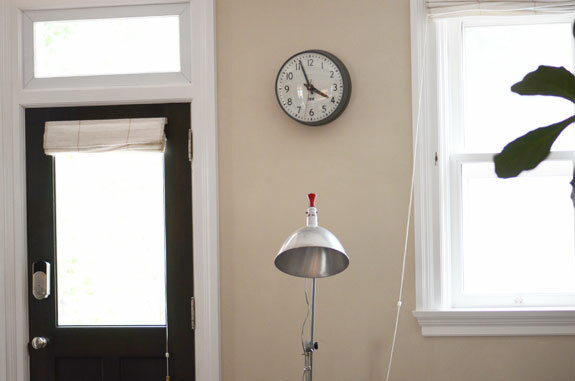 I also shopped online for vintage finds on etsy, that’s where I purchased the old IBM clock in the picture below. Further, we went to great lengths to restore various aspects of the house that had fallen into a bit of disrepair over the years. A team of masons re-pointed the intricate brick work that envelopes the exterior of this historic Edwardian gem. In fact, the masons were a darling family of incredible craftsmen –a father and his three sons (plus their adorable dog) lovingly repaired the house brick by brick. Of course, the kitchen is the heart of our house and we have already made so many amazing memories in it, cooking together as a family. The boys and their friends sit on the stools below, gathered around the center island after school and I make all of these gregarious growing guys (now teenagers) loads of food. I shot the photo below at night with my iphone–I’m surprised at how well it turned out. 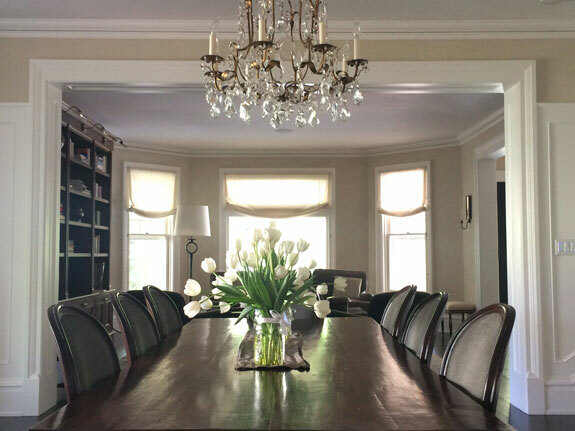 I’ve shared quite a few photos of our newly renovated house on Instagram (follow me here) and have received numerous requests from readers to write about this project here on my website. I’m a little shy, so it took me a year to share this and let you into my home. I hope you enjoy the pictures as well as the story of our renovation. If you did, I might even come out of my shell a bit more and share some other aspects of this delightful project that I not only survived, but learned so much from and enjoyed immensely. I’m a lot more interested in how you chose the final products used, finishes, flooring, paint, etc that were environmentally friendly than the decorating. How did you know what choices were best environmentally? Where did you shop? How do we find people who are knowledgeable and trustworthy in our area? What went into the flooring decisions? Paint? Sealer? Etc. I’m very interested and looking at a remodel coming up one of these years. I am a forester by training but have little background in environmentally friendly building and remodeling materials. I find it overwhelming when I start reading. I’d love to see a series of posts on this topic. Your home is beautiful. May your time in it be blessed.